It’s become a bit of a mantra now but whenever anyone finishes reading Fallen Heroes the novel my first question is ‘Who was your favorite character?’ This questions springs from the fact that the book deals with several main characters and it’s nice to know who readers were rooting for. I don’t know if I should be worried that the majority of those who read the book picked the Reverend as their fave character. Now I don’t want to say too much about the character other than he really is not the sort of man you want to be on the wrong side of. Originally the Reverend was the result of conversation over a few drinks with a friend of mine (yep pete that’s you) who came up with the genesis of the character. At first to me he just sounded like a typical religious zealot turned killer and felt a little stereotyped. As I sat down to flesh out the character I decided to take him on a much more emotionally journey in the book. I was always wanted the core of the Reverend to be that of an ordinary man who saw the world ‘differently’ after what he had been through. He had locked within him a side to his character that was capable of extreme violence a side he had kept it under lock and key from his early teenage years. 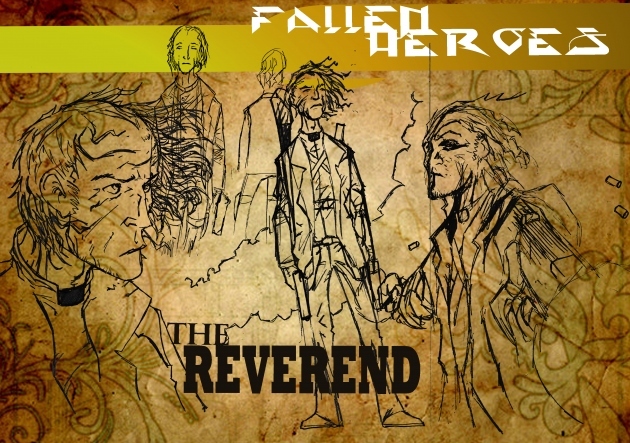 It is something that the spin off Comic featuring the Reverend will explore more of. When it came to describing the Reverend in the book I left his description purposely vague. Of course that may be fine when you’re asking people to use their imagination to fill in the blanks but not really that much help when asking an artist to draw the character in the novel adaptation. Personally I think Steve’s done an amazing job on his final character sketch as I never a clear idea in my head what the Reverend would look like it. The things we did work on was what I did know. He wouldn’t be too good-looking, this shouldn’t be a man who turned heads. We wouldn’t really stand out from the crowd. This is what Steve came up with. You will see more of the Reverend in issue 2 and in the spin off The Reverend: Wrath of God, which is in development at the moment.